I understand that some of you had a problem to downloading the Dusk Round the World Dahlia Block Instructions file that contains the fabric requirement and the Master template from the main post. Have re-loaded the file and am giving the link here too. Happy piecing! Yes, you guessed right. Slow and steady is the mantra for curved piecing! We had reached this stage, when I left you last week! The arcs and the centre had been pieced. Check the pieced arcs, are they nicely pressed? We press from the fabric side, if not! We had put off the trimming of the excess paper from the arcs till we were ready to assemble them, so as to prevent fraying of the fabric at the edges… we do it now. This is the time to be as accurate as you can be as the ubiquitous ¼” seam will finally come into play. We piece the arcs in pairs. I always end up stitching wrong edges when joining pieces, so in each pair, I marked one arc `UP’ and the other ‘DOWN’ on the paper side, depending on how they will go under the needle on the machine. Refer to the Master template and arrange the arcs in two halves. Moving anticlockwise, arcs H to K are lined up around the centre piece Q and arcs D to O around the centre piece R.
Actually, you can begin with any adjoining pair; to stick to the Master template, I start with the pair HP. After trying piecing from both ends – from outside inwards and from the centre to the outer edge, I came to the conclusion that you get better results when you join from the edge to the centre. They do it with pins! Now comes the actual sewing together of the arcs. Essential tools: A box of thin pins, a pair of forceps ( the kind that kids use for their school Biology classes) or tweezers, a pair of small scissors. ..with the foundation paper intact, without the foundation paper except on the corner pieces, trimming the paper up to the dotted seamline on one arc and then on both arcs! Conclusion – If you have the patience to do it ( I don’t!) , trim the foundation paper up to the seam line. You reduce the bulk while making use of the alignment markers. If you used the needle punching method to make the templates, this step is easy, you need only tear along the punched seam line. I also read of some people sewing a line on the seam allowance, just outside the seam line to work as a guide while joining the pieces together. If you feel up to that…great! What I found worked best for me was leaving the paper on while I pinned the arcs together. I preferred to tear it away before sewing. Pick up the first pair of arcs, put the UP arc on top before you start pinning and matching the seam corner at one end. Push a pin vertically in through the two arcs, leaving it hanging down. Align the edges carefully and pin to secure – you can pin on the seam allowance also. Once the corner is secure, move to the next intersecting seam on the two layers. Push the pin all the way down at the point where the seams intersect, till only the head is visible on top. Pressing the two layers between your fingers put a pin on either side of the pin from edge to seam line. The centre vertical pin can now be removed. Now match each intersecting seam – remember you have to match the seam not at the edge of the fabric but at the ¼” point on the dotted seam line. Push the vertical pins all the way through at each point, so that the point of the upper layer lies exactly above the lower one. Again add horizontal pins hanging over the edge on either side of each point, removing the vertical pins as you go along. You can add pins at additional points between the seams also, matching the alignment markers ( the tiny lines crossing the dotted lines). Now we are ready to sew. Have a pin cushion and the tweezers ready by your side! Use the ¼” piecing foot, set the stitch length at 1.5, set speed to “low” and needle position to “down” if you have the option. Before you begin, it is reassuring to remember that all curves are straight as they are going under the needle a stitch at a time! Start at the outer edge. Check your seam is ¼” right from the edge – the fabric is curved so you need to consciously ensure this! Go very, very slow, taking 3-4 stitches at a time, keeping an eye firmly on the edge of the fabric layers about to go under the foot, to ensure that they are perfectly aligned under the ¼” foot edge. Use your tweezers to lightly pull the erring layer into place. It is helpful to stop after a few stitches with needle down, and realign the incoming fabric. If you have not removed the paper, check to see that your needle is travelling on the seam line. Sew right till you reach a pin leaving it in till the last moment, slowly pulling it out as it goes under the needle. If you pin carefully (and plentifully), and sew very slowly, there is no reason why you should not get perfectly matched points! Going back to the UP and DOWN arcs, this picture will always be a reminder to me of how I need to follow my own instructions! Join the two halves of the circle to make the complete dahlia. Fold in the seam allowance and appliqué it to the background, aligning appropriately with the middle lines of the background. There is also a freezer paper method, tutorials available online. Option 2 – Join the two pieces S and T of background template. Join to top half of flower. Similarly piece lower half and join the two halves together to get your 18.5″ dahlia block. While the patterns on this blog are free and will remain free, I would appreciate it if you could follow this link to my favourite not-for-profit charity Samarpan Foundation and see if you would like to help them! Samarpan is managed almost entirely by volunteers, so every dollar counts! Quilt Assistant is a marvellous free resource for quilters interested in designing or even experimenting with various colour options for their quilt blocks. I wanted to share with you the fun I had with the Dahlia Block, when designing it for the Round the Year Block of the Month Quilt! When the dahlia became the eight-petalled lotus! Aren’t they pretty? You can always pencil in your own colours on this DAHLIA MASTER TEMPLATE ! Use this as a guideline to piece a Dahlia designed by you. By the way, this is the link if you want to make Shape Moth’s 20″ `ribbon’ dahlia block. Dont forget to share what you come up with on my facebook page ` Patchwork of My Life’. Click the facebook button on the right sidebar to be able to link with me directly! Author MadsPosted on July 18, 2014 April 13, 2018 Categories Free Stuff - Tutorials and Patterns, Patchwork of my life, Round the Year quiltTags Dreamcatcher Quilt, Foundation paper piecing, free quilt pattern, Quilt Block, Round the Year quilt1 Comment on Some Dahlia Fun! This traditional “DAHLIA” block is the first in the Round the Year Quilt. We use bright/ neon solids and a contemporary black and white print to give it a ‘modern’ twist! The pattern with paper piecing templates can be downloaded from the link at the end of this post. Block size: 18″ square with 15″ inset circle. This block is paper foundation pieced before being assembled. We are chain piecing strips to construct the block. Fabric Requirement – given for strip piecing technique. You need more fabric if you wish to piece the block in the regular way. 8 bright colours across spectrum 6 to 13 Cut 3.5″ square diagonally. Retain 1 HST ( triangle) , putting aside other for use later. 16 arc templates numbered A to P for piecing the outer circle (ring). Template S in 2 pieces S1 and S2 for one quarter of the outside square ( not needed if you are using the 18.5″ square for the background. The Master template below shows how the paper pieced sub-blocks shall be assembled. I suggest you print this file for ready reference. Step by step Instructions for strip piecing, with photos can be accessed here. Piece the centre halves Q and R.
Join the centre top Q to HPAIBJCK and similarly construct the lower half of the Dahlia. If you prefer to appliqué the whole circle or prefer to join it as a whole by any other method, use the 18.5″ square kept aside for the background. Glue together the two parts of template S along the marked edge. Use the diagram below to cut 4 of these – S, T, U and V from the 10″ x 25″ background fabric. Set the circle halves into the background fabric, aligning the markers (crosses and small lines) on the templates. Join the halves to make the square block! I know some of you are waiting for the Rainbow Dahlia templates! I am sorry, I have a back spasm and have been advised rest for a couple of days. Hope to post it by Friday. Will also share with you a couple of more looks for the Dahlia block, using the same templates ! Meanwhile, I would love to connect with you through facebook. All you have to do is like my page ‘Patchwork of My Life’. You can share pics there and post other stuff about this quilt that we are making. Here it is finally – the pattern for the Dahlia Block, with complete instructions for piecing! The Dahlia Pattern Templates and Instructions can be downloaded as PDF files from links at the end of this post. This traditional “DAHLIA” block is the first in the Round the Year Quilt; it is paper foundation pieced . We are chain piecing strips to construct the block. Here are the instructions for piecing the Dahlia. Fabric Requirement – given for strip piecing technique. You need more fabric ( an extra strip of each of fabric 2,3, 4,5 and 7 ) if you wish to piece the block in the regular way. 2. This Master template shows how the paper pieced sub-blocks shall be assembled. You can print it from the Instructions file and try out your own colour schemes; use colour pencils! . Set the circle halves into the background fabric. I plan to set the circles on to the background fabric only once all of them are ready. As I mentioned, we use the strip foundation piecing technique to (chain)piece the block. 1. Cut the strips as recommended. Colour code the strips – mark them with a post-it note! Whenever I don’t do that, I end up using the wrong fabric. For cutting the strips, it is highly recommended ( in fact, essential!) that you pre-starch the fabric. 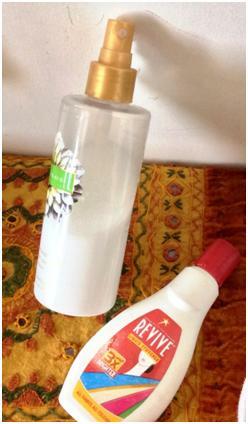 If you do not have access to a readymade spray starch, a good home made option is mixing a liquid stiffener like Revive ( 2capfuls in 100ml) with water in a spray bottle. 2. Cut out all the templates roughly – accuracy not required at this stage. Line up the strips top to bottom needed for these in order. 6. Place the pile of templates A to H close to hand near the sewing machine. Line up the first 2 strips, right sides together, left edges aligned and strip 1 ( yellow 2″) on top, under the raised presser foot – see the photo. 7. Slide the paper template A over the fabric, aligning the seam marker line between A1 and A2 approximately ( at least) ¼” from left edge. ( Accurate ¼” seam not necessary, you can err towards a bigger seam!) Bring down the presser foot and sew accurately on line. Do not cut thread, or remove the fabric/ paper. 8. Now line up Template B under Template A, making sure that the templates do not overlap. Sew on the line between B1 and B2. Line up Template C next…and so on…ensuring you leave about 1/8″ between the paper templates. 9. At the end of this exercise, you have 8 templates A to H lined up and sewn to Strips 1 and 2, like this pic. Carry them to the ironing board. 10. Flip over ( to the unprinted paper side) and press over seam to set it. Open the blue strip and press again. Note the distance between the paper templates in the pic – it is very important that the templates not be too close to each other. .. …and cut the strips carefully, along the paper template edges, to separate the templates. 12. Now to the cutting mat to trim down your seam to ¼”. Fold back the paper to reveal the seam and using your ruler and rotary cutter, trim it down to ¼”. If you are not a perfection freak, it is absolutely okay to just trim the seam with your scissors to approximately ¼”. Now head back to the sewing machine! 13. We now attach the 3rd strip to these templates. Basically, we shall be doing the same thing that we did when we attached Strip 1 to Strip 2. Queue up your templates again A to H.
Place Strip 3 ( right side up) under A2, aligning the edges to the left ¼” beyond the seam line between A2 and A3. Sew on the seamline. Again, do not remove from under machine. Chain piece B, C, D…H as you did for strips 1 and 2. …which you carry to the ironing table! Iron , cut to separate the templates and trim the seams to ¼”. 14. Attach strip 4 , iron, cut, trim seams. …cut apart, seams trimmed. Now trim the outer edges roughly. Your templates A to H are pieced! 16. The next step will be piecing templates I to P.
Here, we start piecing from the outer edge of the circle and go towards the centre. The edges of Strips 1 and 2 are aligned approximately ¼” beyond the seam line 1. Sew on Seam line 1. Without taking fabric and template off the machine, chain piece all the templates as shown in pic above. Follow instructions above to piece the templates, ironing, cutting, trimming seams at each stage. Till here we are, almost at the end of our piecing ! 18. Attach the last strip, iron, and cut apart the templates. Trim seams. 19. Trim the fabric on the edges of the templates roughly. Refer to the Master Template and lay out your pieced templates (alternating the two lots) and admire them! Cut the 2 orange and 2 yellow squares diagonally. Piece using the templates Q and R.
In my original pattern, I had pieced the centre with 16 segments , but have revised it to 8 segments, as the 16- spoked centre became too bulky to handle. Time to sit back and relax …till we are ready to assemble these in a week’s time on 22nd July. 2.INSTRUCTIONS for piecing DAHLIA Block contains the above post in downloadable format. I love foundation paper piecing! In fact, it is my favourite method of making quilt blocks – it gives such fabulous, accurate results and is so, so very easy. To let you into a secret, I feel like such a cheat every time someone goes gaga over my paper –pieced blocks! There are certain patterns which contain odd shaped pieces or are so complicated that you could possibly not piece them by any other method. Miniature blocks are also much easier to handle if paper pieced. But I do know there are some of you quilters who have never ventured into the mysterious world of templates, codes, mirror images, the flip and sew method , yet excited about my Block of the Month quilt `Round the Year’. So, what is paper foundation piecing? It is like ‘quilting by number’. In a paper piecing pattern, you sew fabric pieces on to paper which is printed with an exact replica of a quilt block or portion of a block. The pieces are numbered in the order in which you should sew the pieces. There are several tutorials on the subject for beginners, out there on the big world wide web. Here are some great ones I found – I don’t think I can better these. As one of those tutorials mentioned, paper foundation piecing is one of those things which are much easier done than explained! By now, you would know there are several ways to ‘foundation piece”. We will be sewing directly on to a pattern printed on to paper – the most popular method. I will also show you how to use freezer paper for piecing, in one of the later blocks. Here, instead of sewing on paper, you fold the seam line on the freezer paper and sew along the fold. The template is reusable. As freezer paper is not easily available to all quilters in India, this will be demonstrated as an alternative to the regular paper piecing. There is great method to foundation piece using strips, which I picked up from tutorials available online. We will use this method, piecing much faster than you would think possible. This post is also an introduction to help you `decode’ patterns for paper pieced blocks from the Round the Year Quilt. The paper foundation piecing patterns for the blocks will in the form of downloadable, printable files (PDF). You need Adobe Reader on your PC/ laptop to be able to view them; this is available free online. Each file contains 6-12 pages. Set your printer settings to 100% ( sometimes referred to as “No Scaling”. Some patterns are in `portrait’ mode and others in ‘landscape’ mode. Please ensure that your printer settings are adjusted accordingly. No, this has not been done to confuse you, but to minimize paper usage. Don’t forget to view the tip for saving on printing at the end of this post ! Do you remember the colouring books you loved as a child? The piecing patterns are something like that! Each file contains a number of figures coded A, B, C etc, These are templates. Each template is pieced separately; the pieces are colour coded and numbered A1, A2, A3…, B1, B2, B3… and so on. In the picture below you can see templates G (flying geese in an arc formation) and templates L and M in the form of wedges. You can see that each section is marked with a small coloured square, with a number inside – this is the code number for that colour. If you look carefully, you will observe that only the outermost seam allowance is shown on each template, marked with a dotted line. Cut out each template outside the dotted line. You need not be accurate at this stage; in fact, I always cut slightly outside the seam outline! The Block design in full colour. Each colour is given a code number and usage is given for each fabric code. For example, in the design given below, the blues are coded 2, 4 and 5, yellow is coded 3, orange is coded 6. Fabric requirement of each fabric is provided with code for your convenience. So if in place of yellow you want green, just look up requirement for Code 3. The “Master Template” which shows you how all the templates A, B, C… will be finally assembled to make up the block. Here is an example of a Master Template of a block that I designed and then scrapped because it was `too difficult’ for beginners!. It shows you how the pieced templates A to P provided in the Templates file will finally be assembled! If you are not doing the quilt in my colours, you need only a print out of the Master Template and a box of colour pencils to see how your final block will look! One thing can confuse you – the templates are all mirror images of your original pattern! In this block, the geese are flying clockwise, but in the in this Master Template, they travel anti-clockwise! I did mention that I am using Quilt Assistant a great free quilt design software for these blocks, didn’t I? I hate wasting paper! This is what I was left with after cutting the 16 identical looking templates for Block One. So, when I was making my next block, I used a method I learnt from a BHG quilting book. I took only one print out of a template I was going to need eight of, two sets of 4 wedges – mirror images of each other. I stapled it securely to seven sheets of waste printer paper (a good alternative is leaflets, old directory pages, tracing paper ) and took it to the sewing machine. In no time, the 8 identical templates are ready. All that remains is to code them with the template number, piece number and colour code on the correct side. That is 4 wedges on one side, the others flipped over and marked on the other side. Here, be very, very careful or you will be lost!! One drawback of this method is that you miss out on the alignment markers ( the crosses and the small lines on the seam line) that help you when assembling the block, unless you take the trouble to mark these. However, when needing several identical templates for simple blocks– eg when making a quilt with several rows of pieced flying geese, this is a very useful trick to save on your printer ink! Tuesday, 15th July is when the pattern for the first block will be posted – in less than 48 hours from now! I do hope you have your stash sorted and are ready with fabric for the quilt? I would love to see your selection!